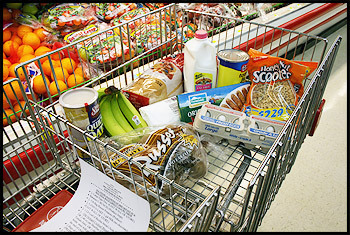 Mavis picks up groceries for both herself and her husband, Russell, each month. Mavis almost literally blew into her local grocery story recently. The weather had been a bit unpredictable in the Northern Plains. We followed Mavis throughout the store and visited with her about the Northern Plains Reservation Aid™ (NPRA) Programs’ Breakfast-in-a-Bag service, which helps food get into the homes of Elders on the Rosebud Reservation. “It saves us a bunch of money,” Mavis was quick to say. She picks up groceries for both herself and her husband, Russell, each month. Ages 75 and 71, respectively, they have been receiving the monthly groceries for over five years —ever since they moved to the area to be closer to her brother-in-law. As we wound our way through the store, she stopped at the upright coolers arranged against the back wall and selected her eggs. She meticulously moved each egg individually to make sure they were not broken or stuck to the cardboard crate. We then asked her if she would share a recipe that for a meal she prepares with all or some of the ingredients she receives from the service. She said to sauté the vegetables, and then to mix them in with the browned hamburger and the rest of the ingredients in a pot. Finally, cover and boil until the spaghetti is the right texture — for about one hour. As Mavis made her way over to the cereal aisle, she selected the oatmeal. Then she traveled to the end and began looking at the bagged cereal selections. She found one bag of the type that she liked because it only had five grams of sugar. Her husband was diabetic, so she had to be careful with her selections. At last, she looked through the basket and checked each of the ten items. We heard her say, “Got my milk, got my eggs, got my sausage…” until the list was expended. She was finally ready to check out. As quickly as she blew through the store, Mavis headed to her car. She needed to return home and start preparing her next meal for her husband. She hadn’t decided if hamburger soup was on the menu, but she had the ingredients, so it was an option. She was glad to share her recipe and very happy to have the groceries!